MCM II Wins the Double! 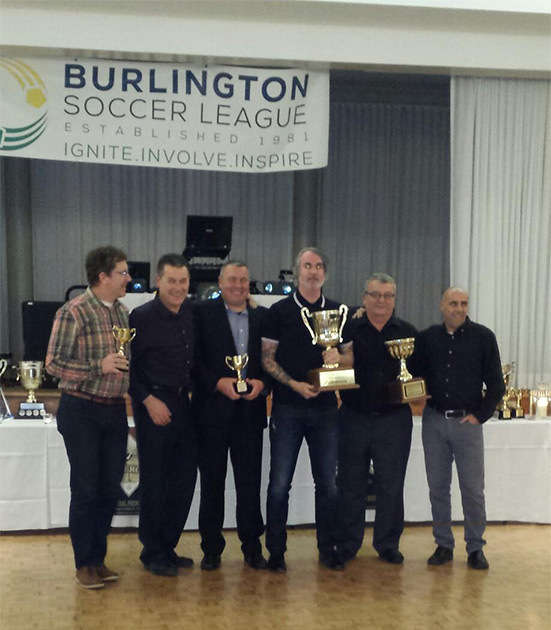 Congrats to MCM II as they capped off a stellar first season in the Burlington Soccer League. MCM II won the BSL open age 1st division with an impressive 10 win 2 draw and 3 loss season. With 32 points and 6 clear from their nearest competitor MCM surpassed there initial pre-season expectations. MCM started out of the gates slow with 2 losses and a tie but they dominated the competition in the games after. In fact MCM won 11 straight games at one point capping off with a Playoff Final win. MCM scored 26 goals during the regular season with MVP Chris Francis scoring an impressive 17 goals! MCM were also solid at the back all season led by ‘Big Al’ Vukcevic. MCM’s backline allowed only 18 goals in 19 games. Well done MCM II on a great season.